Detrusitol may be used to treat people with overactive bladder syndrome (or urge urinary incontinence), whereby they suffer uncontrolled urges to pass urine, need to urinate more frequently, and involuntarily pass urine at inappropriate times. Can I buy Detrusitol online? 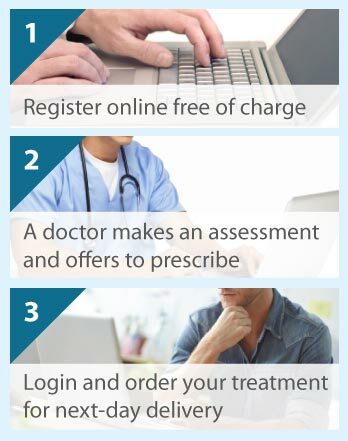 The Online Clinic can prescribe Detrusitol online in certain circumstances. Please complete our brief online consultation pro forma for urinary incontinence and a doctor will decide if it is appropriate to prescribe for you. Tolterodine tartrate is the active compound in Detrusitol. This medicine is known as an antimuscarinic, otherwise called an anticholinergic, which is a muscle relaxant. It works on the bladder (detrusor) muscles, causing them to relax. Normally, a natural chemical in the body called acetylcholine attaches to receptors on the detrusor muscle cells, causing muscle contraction and bladder emptying. Tolterodine works by blocking these receptors on muscle cells, which stops acetylcholine from acting on them. Thus, the overactive bladder muscles relax; they do not contract so often, enabling the bladder to hold more urine and decreasing the frequency and urgency of urination. There are two preparations of Detrusitol: film-coated tablets (Detrusitol 1 mg and 2 mg) and prolonged-release capsules (Detrusitol XL 4 mg). Usually, you either take one of the 2 mg tablets twice a day or one of the 4 mg prolonged-release capsules once a day. Your dose will be lower if you have kidney or liver problems or get side effects. Swallow the tablets whole with water; you do not have to take Detrusitol with food. Continue to take the medicine for as long as your doctor wants you to, and have a consultation after 2–3 months to assess its effectiveness. It is important to know that the treatment does not work immediately as the bladder needs time to adjust. If you miss a dose, take it on remembering only if it not to near the time of your next dose; if you take too many tablets, seek medical assistance immediately. Detrusitol is for adults with overactive bladder only; it should not be prescribed for children. There are some conditions that prevent Detrusitol use. These include allergy to tolterodine or other ingredients of Detrusitol, urinary retention (an inability to pass urine), severe ulcerative colitis, toxic megacolon, narrow-angle glaucoma that is not controlled, and myasthenia gravis. Caution is also warranted if you have any problems with passing urine or stools (or you ever had these problems); a condition of the liver, kidney, heart or gut; a condition affecting the part of the nervous system that unconsciously controls bodily functions; hiatus hernia, or low blood levels of potassium, magnesium or calcium. Detrusitol is not recommended for women who are pregnant or wish to conceive, or during breastfeeding. Because tolterodine may interfere with other medicines and vice versa, let your doctor know about all your current and recently discontinued medication, particularly certain antibiotics, antifungals, or medicines to treat HIV. Mention all medicines affecting food passage in the gut, heartbeat, and that either have an anticholinergic or cholinergic mechanism of action (i.e., they work in the same or opposite way to Detrusitol, respectively). Dry mouth, digestive problems (e.g., dyspepsia, abdominal pain, wind, constipation, and diarrhoea), difficult or painful urination, fluid retention causing body parts to swell (e.g., ankles), giddiness, drowsiness, fatigue, headache, sinusitis, dry eyes, and blurred vision are common side effects of Detrusitol. Other less common effects include bladder emptying problems, palpitations chest pain, an irregular heartbeat, heart failure, memory impairment, worsening dementia symptoms, or confusion. Immediate medical attention is called for in two uncommon situations; firstly, in the case of an allergic or hypersensitivity reaction (swelling of the face, tongue or throat; breathing/swallowing difficulties; itching and skin rash) and secondly, if you experience any chest pain, breathing problems, fatigue even while resting, or swollen legs as you may have heart failure.